The tapered solitaire engagement ring is such a great look, especially when looking at it head-on. 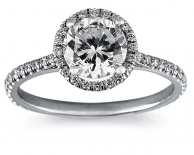 This ring combines a tapered band with a four-prong setting for the center diamond, which can be any size or shape. We're not especially fond of emerald-cut diamonds here at Engagement Ring Wall (just personal preference :)), but this ring makes them look amazing! 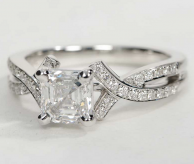 The baguette diamond sidestones compliment an emerald cut center diamond perfectly. 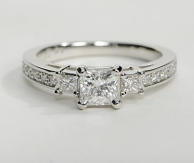 You can choose any shape diamond, but we of course recommend an emerald cut diamond for this setting. Breathtakingly unique engagement ring in white gold with delicately detailed hand engraving on the band. 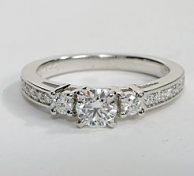 The center diamond that you choose to set in this ring will look great with the accents around the ring. 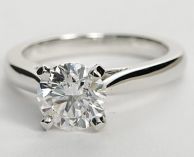 Beautiful, simple and elegant solitaire engagement ring. The thin (or as they call it, 'Petite Nouveau') band is made of gorgeous 18k white gold and will make your diamond really pop. Slightly less versatile than other solitaire rings, this one can only be set with a round, Asscher, cushion, or radiant shaped diamond. Elegant and feminine, this diamond engagement ring features pave-set round diamonds in a knife edge design of 14k white gold to complement your choice of diamond. This solitaire engagement ring has a trellis setting holding your center diamond, with a thinner band constructed of 14k white gold. The diamond of your choice, a round, princess, or Asscher cut stone, will be displayed beautifully. A trio of diamonds, including the center diamond of your choice, sits atop a gorgeous 14k white gold band with 10 pave diamonds embedded in the side. The center stone can be any shape and almost any size.